For lawyers who aren’t necessarily clinically depressed (which is a serious illness requiring medical intervention and professional help), but feeling angst or lingering malaise, one possible antidote (and by far, not the only one) is… blogging. 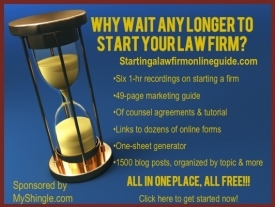 Whereas law practice enslaves lawyers, blogging empowers, giving lawyers a unique voice in a world where they usually serve as a mouthpiece for others, giving them control over a domain, even if it’s just a tiny little piece of the Internet. Most importantly, blogging builds connections and conversation with others, and eradicates the sense of loneliness and isolation that serve as a breeding ground for depression. And already, one commenter has agreed that blogging helped him to recover from a low point in his career. But blogging goes beyond personal empowerment; it can create huge, life changing opportunities. In her comments to a post at Simple Justice, Sui Generis blogger, Nicole Black attributes her most recent credential as a Thomson-West book author to her blog. But here’s one of the most exciting ways that blogs can change a life. Back in July, at my Renewables Offshore blog, I posted about William Kamkwamba, a twenty year old who blogged about his experience of building a windmill for his remote village in Malawi, and as a result, helped find funding for his education. His blog was featured as a Typepad Blog of the Day and more recently, Kamkwamba was featured on the cover of the Wall Street Journal. If you think these results can’t happen to you, think again. As I’ve written before, some of the greatest opportunities for solos to soar happen by sheer, serendipitous accident – and if you blog, you just may find, some accidental success waiting to happen.